Thankfully the austrian TV station was there to document parts of the festival. 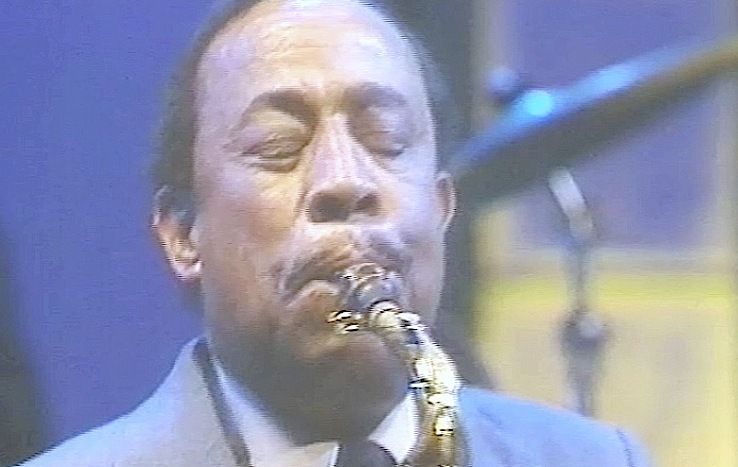 I do not know how much they filmed, but fortunately I found clips from four of the concerts on my late friend Otto Flückiger’s old VHS tapes, which I decided to present here. Starting chronologically here is Miles Davis’ band from July 5. The lineup: Miles Davis (tp, keyb); Bob Berg (ts, ss); John Scofield (g); Robert Irving III (synth); Darryl Jones (elb); Vincent Wilburn Jr. (dr); Steve Thornton (perc). They are playing “Pacific Express” and “Time After Time”. Note that according to the list on this page “Time After Time” was played way before “Pacific Express” (there are also a lot of great photos of the band in Hollabrunn on that page). In fact I had found the two tracks on two different VHS cassettes and made the segueing myself. After I discovered the real order of tunes, I was not in the mood to go into the editing process all over again. The next clip comes from July 6 and presents the Tommy Flanagan Trio. Flanagan is accompagnied by bassist George Mraz and drummer Art Taylor. This was also on two different VHS cassettes. So after the Monk Medley there is a segueing (done by me) and then comes an unidentified ballad followed by Tadd Damerons “If You Could See Me Now”. For all I know true sequence of tracks could have been the other way around. Next up – also from July 6 – is a rarety as it shows Pharoah Sanders with a group that did not appear on any official albums. Here Pharoah is accompagnied by pianist Joanne Brackeen, bassist Clinton Houston and drummer Victor Lewis. They are playing Brackeens composition “Haiti B”. And to leave Hollabrunn we have Fats Domino with an unidentified band doing his 1960 hit “My Girl Josephine” on July 7. Have you seen the jazz yesterday? Maybe it is unfair to say “there was a time when more jazz was featured on TV”. I would not really know, because I stopped watching TV a while ago. Of course here in switzerland there is still some jazz on the public TV, late at night at some time. But in the 1980s there was still some jazz to be seen and witnessed by people who did not expect to be treated with jazz when they turned on the TV. There were some broadcasts on swiss TV which you could say were in some kind of “magazine” format. Maybe some news from different regions, a talkshow guest, a funny report — you get the picture. At the end they always had a short slot for musical artists of every genre that happened to be in Switzerland – just a few minutes to promote their tour. My friend, the late jazz researcher Otto Flückiger, must have scanned the TV program magazines every week to see if an interesting (interesting to him that is) band or musician would appear – since he managed to tape quite a lot of this jazz, blues and soul bits. I am offering you a little potpourri here of different things you could see – if you were aware when and where to look. O.K. I admit that my clip of Pharaoh Sanders singing was not that great. So for the disappointed Sanders fans here is something you might really like: Pharaoh Sanders guesting with the McCoy Tyner Trio at the Estival Jazz in Lugano on July 3 1985. Besides Pharaoh and McCoy you get to see and hear Avery Sharpe on bass and Louis Hayes on drums. But beware: At the beginning the sound is not too good – it gets better soon though. As you may have realized, this blog is mostly dealing with jazz from all periods. And of course nothing is a better bridge from the ancient times to the future than the music of Sun Ra, the cosmic messenger. When I started to listen to jazz in the mid 1980s, I was mostly fascinated by the free music of the 1960s. And it was Sun Ra that showed me how to proceed back in time in my listening pleasures. I witnessed Sun Ra leading the Arkestra five or six times from 1987 to 1990. And it was my love for Sun Ra’s music that was responsible for me and the swiss jazz researcher and collector Otto Flückiger becoming friends. I got to know Otto when I visited the Sun Ra exhibition at the Jazz Museum in Arlesheim that he had curated in the early 1990s (Otto had also written the first Sun Ra discography back in 1962!). You will see and hear Sun Ra (p, syn, voc); Ronnie Brown (tp); Tyrone Hill (tb); Marshall Allen (as, fl, ob, perc); John Gilmore (ts, cl, timb, voc); Ronald Wilson (picc, ts); Danny Ray Thompson (bars, perc); Eloe Omoe (as, bcl, cacl, perc); James Jacson (bsn, fl, Ancient Egyptian Infinity Drum); Bruce Edwards (eg); Rollo Radford (double eb); Tommy “Bugs” Hunter (dr); Avreeayl Amen Ra (dr); unidentified (perc); June Tyson (voc) and an unidentified dancer. Part 2 consists of Love In Outer Space and The Shadow World. 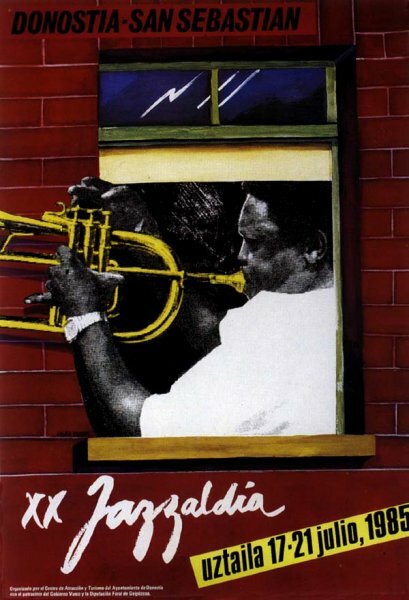 Blog follower Agustín Pérez was so nice as to send me the poster for the Jazzaldia 1985 festival as well as a review of Sun Ra’s appearance. Thank you very much, Agustín! While checking Youtube for footage of Anthony Braxton, I saw that someone uploaded a video allegedly showing the Anthony Braxton Quartet 1985 in Berlin. But in fact that video shows Braxton’s group with Hugh Ragin 1981 in Hamburg. So I dived deep into my large box of old VHS videos and came up with the old TV broadcast from the GDR TV station that really shows the 1985 quartet at the Friedrichstadtpalast in East Berlin on June 21, 1985.